I’m currently house-sitting and without super crafting supplies, so I thought I’d do a throw-back. Luckily I did bring my crocheting, so I’ll be able to handle that for the time-being. There are kitties in my midst and I am not sure if they fall into the stereotypical realm in their love for yarn… so I haven’t yet broken that out. I gave a little bit of a back-story to “Craft and Wine Night” before but thought I might elaborate. Michelle, Lisa and I have been doing the craft and wine nights for a while. Lisa was the one to introduce Pinterest to Michelle and I (TERRIBLE IDEA) and of course I did a really good job of spreading it to my co-workers (YOU’RE WELCOME!). 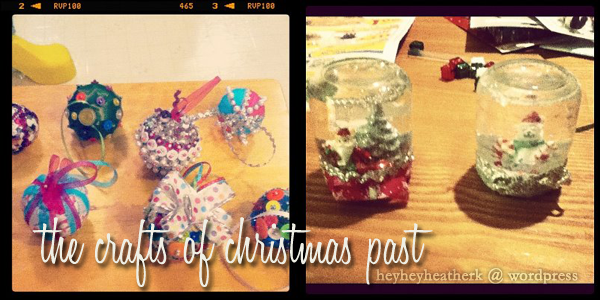 We started around Christmas, getting together every weekend to do a different craft and have picked it back up. With all of our busy schedules, it’s such a nice way that we can all get together and catch up and of course try the ideas we see on Pinterest. 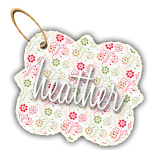 We’ve all been crafty for so long and now we’re just converging that craftiness into one giant family of crafters. I’m pretty ok with that. Below are some of the crafts we made together! So how did we make them? Well, it was definitely trial and error. We tried putting oil in with water and glitter, however, it got clumpy and didn’t work. We glued some small tree ornaments and figurines on the bottom of the lid, leaving room to screw it back on the jar. Making sure we had enough glue to keep the figures stuck to the bottom. From there we put just a bit of fine glitter into the jar and filled it almost full with water (leaving room for to shake it and disperse when we put the figures in). We glued the bottom onto the jar once we tested it to see that it worked to keep it from leaking and finished it with ribbons to keep it festive and hide the jar lid. Was definitely a TON of fun to make! This is actually something very near and dear to our hearts. My great-aunt Annie used to be super crafty and used to make all kinds of crafts for Christmas! These ornaments were one of them! So I was really excited when Michelle suggested we make them! It turned into a sort of ode to Aunt Anne! So how did we do it?! We used all different sizes of Styrofoam balls and wrapped with different types of ribbon. Some of them had to be glued down to keep the ribbon from spiraling off. We then took colored push-pins (flat end pins with small pearls) to secure the buttons to the ornaments, some in different patterns. Again, another really fun Christmas craft! The guys even got involved and made their own! And we also brought back a craft that reminded us of family! I saw this tut on Pinterest around Christmastime and was SHOCKED to see that it was so easy! I had to try it, I needed to see if this Pledge business worked! So how did I do it?! It is as simple as squirting some Mop & Glow into glass (I have not tried plastic) ornaments and pour the remaining into a glass or cup, making sure the entire inside is covered. Sprinkle some glitter into each ornament and make sure to twirl and cover the full glass, pouring the glitter onto a piece of paper so that you can use it again. Let it dry and secure with the top. I used ribbon to hang them instead of ornament hangers. It was a little bit messy, but it worked! I decided to make my own Christmas cards this year… I didn’t get a chance to send many out (FAIL WHALE) except for like… two. But at least they are ready for this year! Of course, had some fun with buttons and glitter! I also wanted to make a new wreath for our front door. I decided on the gold/silver/white theme (I’m getting very into mixing gold and silver) and went during lunch one day to Michaels to buy some ribbon, a twig wreath, and some flowers. I bought the numbers beforehand and painted them gold, with silver stripes, and white polka-dots. A lot, yes, but those rules aren’t real. It actually stayed on our window for months afterwards and took a beating from some snow, some thunderstorms, frost and I think we even had it up during the tornado! STILL INTACT! Take that! So there you have it. There may have been more but that’s a jist of most of our/my Christmas crafts that started it all! Hope you enjoyed that trip down memory lane with me!